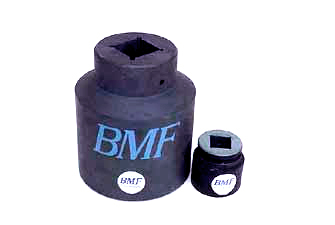 BMF Torque Wrench Co. has the big power sockets you need for heavy industrial size bolts. Our Sockets are made from heat-treated alloy steel and meet or exceed government and industrial specifications. Finish is Black Oxide. These sockets are suitable for use with either impact or power wrenches. 12-point hex and deep length sockets for application where a stud extends above the top of the nut being tightened. Special configurations such as nonstandard sizes, square sockets, thin wall, or extra deep can be produced on short notice to meet your requirements. BMF can furnish sockets in all Inch and Metric sizes within the ranges shown in the table below. All of our sockets carry a lifetime warranty against defects in material or workmanship. Call us for a competitive price quote. We can manufacture any custom size sockets, or drive/socket combinations. For a comprehensive listing of available sizes and accessories click here.